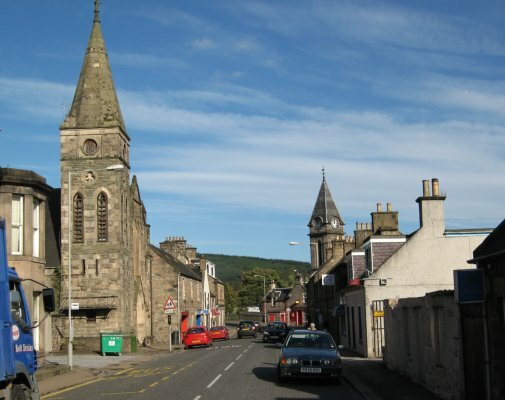 Rothes High Street @ High.St - High Street shops and High St businesses. Large Google map of Rothes High St.
Rothes is quite a small village with its few shops spread out along its long high street. We haven't listed them here but as Rothes is in the heart of the Speyside Whisky trail, we guess most people will visit the Glen Grant distillery and garden. Visits are free, making this one of the more popular sites to visit! But please note children under 8 are not allowed in the production areas. Whilst in the area, we recommend visiting the Speyside Cooperage as it's one of the most fascinating places we've seen for a while. Not surprisingly, there are quite a few sites associated with whisky but our two favourites are MaltWhiskyTrail.com and ScotchWhisky.net. For information on the annual Spirit of Speyside Whisky Festival, try the official site or Speyside Moray for more general information on the area. Other towns that lie on the Spey or are on the Whisky Trail that are featured on this site include: Aberlour, Aviemore, Elgin, Forres, Grantown-on-spey and Keith. Detailed maps and information from RPA Smith Street Maps web site.